Google announced an update to its namesake app for iOS yesterday, adding a resumable private browsing mode and inline YouTube support. The new private browsing feature apes Incognito mode from the company's Chrome browser, along with its dark window theme, but adds an extra layer of privacy, too. Like Chrome, search and browse history are not saved when the mode is enabled, but Google app users can also enable Touch ID for the feature, allowing them to re-enter an existing Incognito session after exiting the app. Additionally, the Google app gets inline support for YouTube videos, allowing for instant playback within search results, instead of being switched to another browser window or the YouTube app. The update also renames Google Now to "the feed", and brings increased stability for iOS 10 users as well as performance improvements that promise to reduce crashes by half. The new Incognito mode does not appear to have rolled out to all users yet, but once it does, the mode can be enabled by tapping into the app's account settings screen and selecting "Turn on incognito". 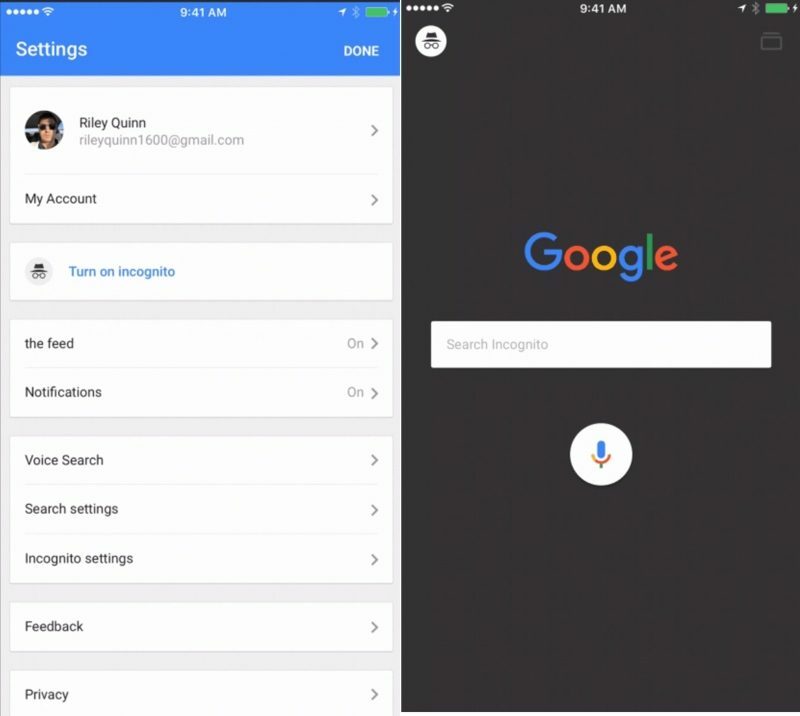 A hard press of the Google app icon from the home screen also turns up a 3D Touch option to enter the mode on compatible devices. The Touch ID feature can be configured in Incognito settings. Google don't sell your data. That's not an income stream they have. They may not sell the data per se, but they sell profiles they construct based on those data. And by getting more and more detailed, those profile can be used to destill knowledge about single persons, even if the data are "anonymized". You're being sarcastic , right ? Right ? [doublepost=1475062702][/doublepost]Google Mail now requires an phone number ( and there is no way around it). With that, and all your browsing history and email exchanges, they now have enough precision to identify you personally ( name, address, etc..). That's Google's way of saying "We promise not to sell your fingerprints and other online session histories to the highest bidder. We promise! No, really! We really mean it this time!" Luckily the fingerprint handling is entirely done by iOS. Google never gets the fingerprint, just a "the fingerprint is okay" or "wrong"
Funniest thing I've read all day!!! Oh yes, they know you very well. MS, Apple, Facebook etc all do. But they don't sell your data. They serve adds based on the information you have. The advertiser doesn't get your data. I'm not pro google, but the narrow minded 'Apple is perfect view and everyone else is evil' is very absurd. This is common and confirmed knowledge. Look at the accounts and the t&c's. Not everything they do is great, but this isn't something they do. LOL, but you're right they'd never sell the goose that lays golden eggs. They only rent it to the highest bidders.